There’s a playground near the Bathhouse cafe right next to the water in the centre of Queenstown which was updated in 2018 to turn it into a destination playground. There’s a net rope structure, slides for all ages, wooden beams and an obstacle over the stream and through the trees, swings for all ages including a bucket swing. 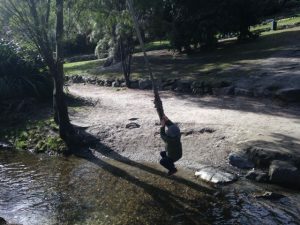 A real highlight for older kids in this area could be the rope swings over the stream and willow trees that are perfect for climbing! It might pay to have a spare pair of shoes with you or if the weather’s warm enough, take shoes off before they swing over the stream. Adult supervision is recommended. The coffee at the Bathhouse Cafe is supposed to be pretty good too!